Jackie DeShannon is one of the great pop figures for all sorts of reasons. And one of those reasons is that her spectacularly soulful early ‘70s Tom Dowd/Arif Mardin produced set closes with her own song 'Anna Karina'. Jackie says: “I was a big fan of Anna Karina ­ I saw every film that Jean-Luc Godard made.” She would later write a hit song called 'Bette Davis Eyes'. If only it had been called 'Anna Karina Eyes'. “He was fairly universal, he made people shiver everywhere. And he made thrillers that are also equivalent to works of literature. There was a period when Hitchcock made seven or eight films in succession that are perfect, that were emblematic, because they extended cinema itself, because they were based on the philosophy of cinema,” said Godard about one of his inspirations. Of the films Godard made before his Vertov-era there were seven-or-eight titles that he made with Anna Karina, which are as perfect as anything by Hitchcock. And whille even in that period, from A Bout De Souffle through to Weekend, Godard made as many other films, and Anna would make many more (like the great Chinese Roulette, with Fassbinder), it is as hard to imagine Godard’s work succeeding, or having such impact, without Anna Karina as it is to imagine Postcard Records working quite so wonderfully and meaningfully without Orange Juice. Godard’s films are full of references and quotes, so it’s appropriate to use his words again: “We’re born in the museum, it’s our homeland after all, we’re the only ones ..” Sometimes I think it’s a library I was born in, but yeah I get his point. There’re many stories of great people, like Albert Camus and Julie Burchill, who have sought refuge in libraries as kids and lost themselves in books, and the free access to books remains one of the great things about the world. I remember being young and impressionable, borrowing a copy of Godard on Godard from our local library, and not necessarily following much of his critical writings, but being completely entranced by the stills from his films, and in particular the photos of Anna Karina. 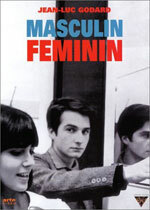 I had picked out this book because of the song 'Alphaville' by the Monochrome Set (an early Rough Trade single) which I had learned was a reference to a Jean-Luc Godard film, and because my new hero Vic Godard had adopted his pop identity as a tribute to the french new wave director. And there was a Wire song around called 'French Fim Blurred'. It all seemed to fit together. Vic Godard and Rob Simmons from Subway Sect opened my eyes to the possibilities of French culture. In passing Vic would mention Moliere and Francoise Hardy, and Zigzag magazine featured the group performing in Paris, and meeting Nico. Subway Sect are now depicted as autodidacts, like in Sartre’s Nausea, touring libraries in south west London, and hanging around in cinemas to absorb the old French new wave films. Like many others, I tried to follow suit. And yes, for that teenage me, those photos of Anna Karina in Godard on Godard seemed to epitomise French elegance and art. What I didn’t realise was that Anna was in fact Danish, and had escaped very young to Paris, where she was discovered modelling by Coco Chanel and renamed Anna Karina. She was then in turn discovered in a commercial by Jean-Luc Godard and became his muse and partner, starring in that exceptional series of films from Le Petit Soldat through to Made In USA. 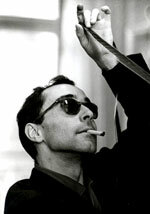 Much has been written about Jean-Luc Godard, and while his popularity may vary his significance remains. Growing into film making from being an obsessive and a critic (like many of the most adventurous music makers were once fanzine writers and enthusiasts), he got away with filling his films with references to great moments from cinema history (in a way the generation of pop adventurers that grew up on punk rock would be criticised for). The book is filled with passionate writings on the likes of Nicholas Ray and Hitchcock. Best of all are his enthusiastic words about Bergman, and in particular the magnificent Summer with Monika, which he says is Et Dieu … crea la femme, but brought off brilliantly, without a single flaw, without a single hesitation, with total lucidity in both dramatic and moral construction and in its development”. He goes on: “One must see Summer with Monika, if only for the extraordinary moment when Harriet Anderson, before making love with the man she has already thrown out once before, stares fixedly into the camera, her laughing eyes clouded with confusion, and calls on us to witness her disgust at involuntarily choosing hell instead of heaven. It is the saddest shot in the history of cinema”. 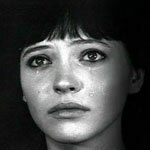 Then all I could do was criminally tear the photos of Anna Karina from a library book. Now I can watch any of the films Jean-Luc Godard made with Anna Karina whenever I want. And I do. The photos and stills still look so iconic (which is why the Make-Up used some for their I Want Some singles collection), and the films still seem so special. Credit must be given for Anna’s adaptability, for carrying off Godard’s obsessions and translating his strange ways of working into great cinema performances whatever the demands and difficulties were. Back in Postcard times, Roddy Frame and Aztec Camera sang “’Cos I wanted the world, and all I could get to was a gun or a girl”. Jean-Luc Godard would jest that all he needed to make a film was a girl and a gun. And the iconic stills show Anna and gun (“a poet named revolver”) in Alphaville or Made In USA. And back in the 1990s there would briefly be a surge of activity, where riot grrls with hairslides and cans of vitriol would dream of being Anna Karina with scissors in that scene from Pierrot Le Fou. If Anna could break our hearts in Vivre Sa Vie sitting alone in the cinema, silently weeping, then she could equally made our hearts leap for joy in Bande A Part, dancing the Madison with her gangster pals. It’s really one of those scenes that make your soul sing. And it’s one example of the great use Godard put music to. Like the absurdly punk row of Mao Mao in La Chinoise. Ah how I would love to stumble across the Claude Channes original vinyl of that. I do at least have a facsimile CD of the Chantal Goya EP of songs she sings in Godard’s wondrous Masculin Feminin. And objects of desire don’t come much cooler than that. Chantal is exquisite in the film (the one where the infamous children of Marx and Coca Cola line comes from) and again there is a wonderful iconic dance scene, just before Sandie Shaw gets a mention. Anna Karina does get to sing in Godard’s Une Femme Est Une Femme and Pierrot Le Fou, but her greatest musical moments came later when she worked with Serge Gainsbourg on the musical-comedy Anna. The film is at the time of writing frustratingly unavailable, though a Philips CD reissue of the soundtrack is another object of desire. The highlight is the astonishing 'Roller Girl', an unlikely garage roar, with Anna positively growling her way through the number. 'Sous Le Soleil Exactement' is more stately and seductive, as is her duet with co-star Jean-Claude Brialy on 'Ne Dis Rien'. The performance of 'Ne Dis Rien' is one Anna reprised with Serge himself, which is preserved for posterity on the D’Autres Nouvelles Des Etolies DVD collection, and it’s mesmerising watching Serge and Anna dancing slowly, staring meaningfully into one another’s eyes, and the tension is incredible, in a way even Nancy and Lee could not match on 'Some Velvet Morning'. And Jonathan Demme would use Anna’s performance of 'Sous Le Soleil Exactement' 35 years later in his The Truth About Charlie, in which Anna herself makes a cameo appearance as a cabaret singer and oblique references are made to the French new wave classic Shoot The Piano Player. Demme despite his great success as a director still loves to slip in references to his early loves, like the improbable use of The Prats’ classic Rough Trade single 'General Davis' at the start of his remake of the Manchurian Candidate, which led directly to a very important collection of all their recordings. Anna’s 'Roller Girl' in particular is a recording that has resurfaced on a number of collections of 1960s French pop, as it has gradually grown in importance thanks to the great work of salvage specialists. The Make-Up took the sound of yeh-yeh and mixed it with gospel, while many others from Vic Godard and Kim Gordon to Saint Etienne and Stereolab paid their respects, and elevated the sound of everything from (beat girl) Gillian Hills and Jacqueline Taieb to France Gall and Francoise Hardy to Brigitte Fontaine and Jean-Claude Vannier. So yes it’s the right thing to love Marie Laforet in the Plein Soleil film of The Talented Mr Ripley and then love her pure punk interpretation of 'Paint It Black'. French is such a great language for pop. Even some of the songs that changed my life were recreated in French, like Orange Juice’s 'Poor Old Soul' and The Teardrop Explodes’ 'Treason', and worked fantastically well. Going further back, pop stars like Sandie Shaw (who gets mentioned in Masculin Feminin) would reinterpret her songs in French (and indeed Italian) ­ and they were gorgeous. Marianne Faithful too got to sing in French, and had the honour of singing 'As Tears Goes By' in Godard’s Made In USA. Marianne indeed proved something of an iconic influence on both sides of the Channel in the mid-‘60s, with her unique folk pop, perhaps best heard on numbers like 'Come And Stay With Me' and 'In My Time Of Sorrow', which just happened to be written by Jackie DeShannon.